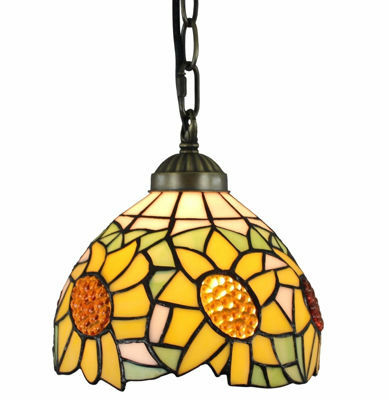 The perfect expression of timeless style and modern beauty, this Sunflower pendant lamp glows with soft colors. This Tiffany style lamp is handcrafted using the same techniques that were developed by Louis Comfort Tiffany in the early 1900s. This stained glass product has been protected with mineral oil as part of the finishing process. Please use a soft dry cloth to remove any excess oil. Attention California residents: This product contains lead, a chemical known to the state of California to cause cancer and birth defects or other reproductive harm. Note: Shade colors will appear darker and less vibrant when not illuminated. The handcrafted nature of this product creates variations in color, size and design. If buying two of the same item, slight differences should be expected.